Metropolitan Elpidophoros said the closure of the seminary was a great loss for Turkey and Islam, as it was a beacon of the peaceful co-existence of Christianity and Islam. Tsipras and Ecumenical Patriarch Vartholomeos called on Turkish authorities to approve the re-opening of the historic institution which for generations was the training ground for priests and patriarchs. 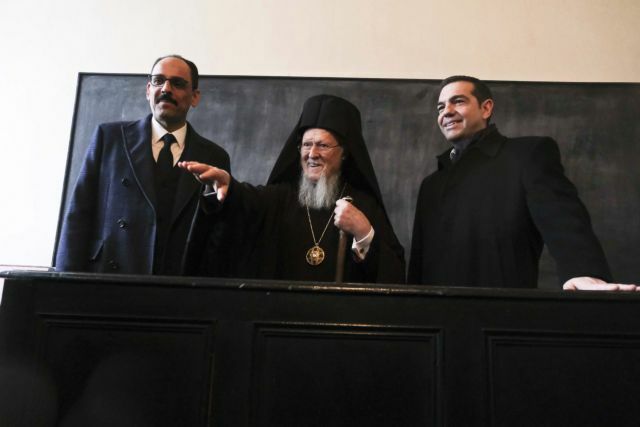 Prime Minister Alexis Tsipras on a visit to the Ecumenical Patriarchate’s Halki Theological Seminary issued a call for Turkish authorities to approve the re-opening of the historic institution which for generations was the training ground for priests and patriarchs. Tsipras thanked Ecumenical Vartholomeos for the tour of the school (high school and seminary) where he went from the island of Imvros at the age of 15 to train for the priesthood. Tsipras and Vartholomeos symbolically planted a tree in the expansive gardens of the seminary. Tsipras bemoaned the closing of the school by Ankara in 1971, and extolled the fabulous library of the Halki Seminary library with its 100,000 books. He described it is as an ark of wisdom and knowledge and noted that the Greek Parliament has contributed greatly to the huge task of digitising the library’s collections, including countless very old and rare books. Tsipras said he had the opportunity to visit “extremely important monuments of Hellenism and Orthodoxy here in Constantinople (as Istanbul is still named in Greek), monuments of the world cultural heritage which now belong to all of humanity, and are ecumenical monuments,” indirectly referring to his historic visit to the sixth century Hagia Sophia basilica, once the patriarchal cathedral, the first by a sitting Greek Prime Minister. The visit had an additional symbolic charge as there have been calls of late from Turkish Islamists for the museum to re-operate as a Mosque, as it did between the Conquest of Constantinople in 1453 and until Kemal Ataturk turned it into a museum in 1935. “We do not overlook the fact that these are monuments of Hellenism and of a Greek community and minority here in Constantinople which endured great difficulties. It was injured, chased, and decimated but did not lose its roots. It may seem like an injured tree trunk, but the roots exist, breathe, and are here,” Tsipras said. Tsipras noted the progress made during the Erdogan administration in returning a large part of the Ecumenical Patriarchate’s properties which had been seized by the Turkish state over many decades. The Abbott of the Monastery of the Holy Trinity which operates on the site of the seminary, Metropolitan Elpidophoros of Prousa (Bursa), underlined that the closure of the seminary was a great loss for Turkey and Islam, as it was a beacon of the harmonious integration and peaceful co-existence of Christianity and Islam. For his part, Vartholomeos said that while the times change, “the mission of the Church of Christ remains unmoved and unalloyed as it is built on a rock”. The 79-year-old Ecumenical Patriarch expressed his prayer that he will live to see the re-opening of the seminary. He underlined the great symbolic significance of the PM’s visit and stressed that Greece steadfastly supports the redressing of an historic injustice. Moreover, Vartholomeos referred to the dispute between the Moscow Patriarchate and the Ecumenical Patriarchate over the latter granting the status of a self-governing Church to the Orthodox in Ukraine. In that context, Vartholomeos rejected Moscow’ charges that he is taking on papal authority (as opposed to the synodal system of the Orthodox Church), as he exercised his duties and rights as enshrined in Church Canons in granting the request of the Ukrainian Orthodox flock.